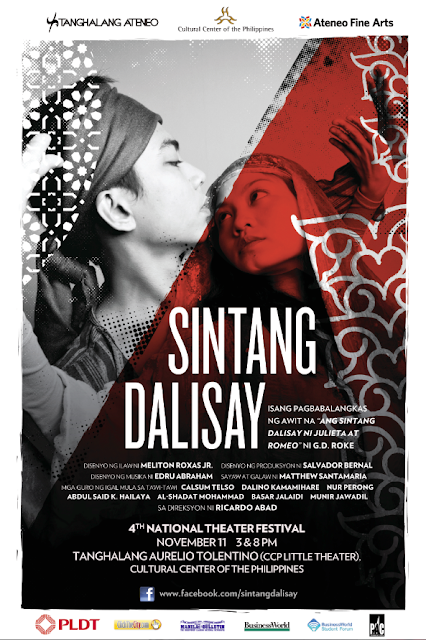 Tanghalang Ateneo's Sintang Dalisay will be shown at the 4th National Theater Festival at the Cultural Center of the Philippine on November 11, 2012. It will also be shown at UP-Diliman on November 24, 2012. Weaving G.D. Roque's 1901 awit, "Ang Sintang Dalisay ni Julieta at Romeo," and Rolando Tinio's translation of William Shakespeare's Romeo and Juliet, Sintang Dalisay hopes to captivate audiences with a total performance style that builds on the performance traditions of the Sama Dilaut in the Sulu archipelago. This Filipino rendition of a classic tale is set in an imaginary Muslim community, where the distinguished households of Mustafa and Kalimuddin breathe the ancient grudge of this familiar scene. Caught between, are star-crossed Jamila and Rashiddin, lovers married sundered by the consequence of filial vengeance and contempt. Misguided fate and judgment lead to bury the lovers and their families' ancient grudge. The stylized verse of the awit is accompanied by movement drawn from the igal, the traditional dance of the Sama Dilaut, popularly known as the Badjaos, a dance that parallels the swaying of palm trees and the flow of sea waves. 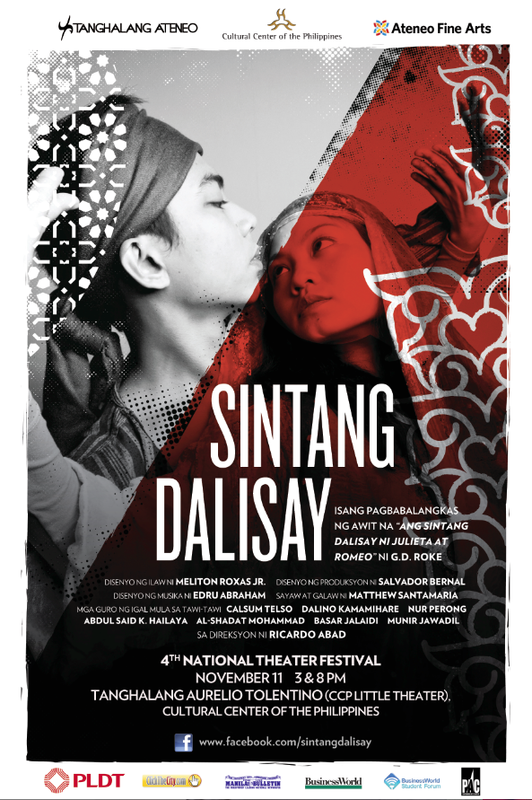 While the use of traditional styles is certainly not new to Philippine theater, what distinguished Sintang Dalisay from earlier works are the production process and the performance style. The process entailed summer workshops on igal dance and music, chanting, and silat, a martial arts form unique to the area, taught by indigenous artists from Tawi-Tawi. These master teachers also oversaw the actors’ improvisation of basic igal and silat to suit the text’s dramatic narrative. Ricardo Abad, who together with Guelan Varela-Luarca shaped the performance text, directs the production. Matthew Santamaria choreographs, while Pedro Abraham Jr. orchestrates music and sounds along with Kontra GaPi and the Tanghalang Ateneo Traditional Music Ensemble. Meliton Roxas Jr. lights the stage, while David Fabros supervises the graphic look. The original design of late National Artist Salvador Bernal for costumes and set remains intact. Kalil Almonte plays the role of Rashiddin while Tasha Tanada and Cindy Lopez alternate the role of Jamila. Brian Sy plays the Imam who brings the lovers together. The rest of the cast also take on roles as narrators, musicians, chanters, and to some, other characters as well. Each actor becomes a total performer on a bare stage, a traditional performing style that challenges actors and delights contemporary audiences. Shows at the National Theater Festival are scheduled on November 11, 2012 at 3pm and 8pm. This will again be restaged at UP-Diliman on November 24, 2012. For inquiries and reservations contact Regina Aquitana at +63.915.1129301.